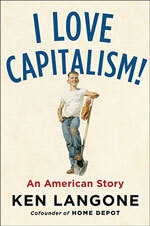 “Capitalism works” is how Ken Langone, billionaire co-founder of Home Depot, opens his new book, I Love Capitalism! : An American Story. Last week, I had the privilege to attend the Cornerstone Macro Conference in New York. 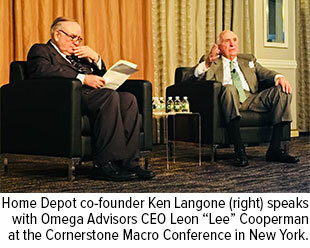 Langone’s presentation, moderated by Omega Advisers CEO Lee Cooperman, stood out as one of the highlights. Growing up poor in Roslyn Heights, Long Island, the son of a plumber and a school cafeteria worker, Langone didn’t initially seem destined for greatness. But like other self-made billionaires, Langone didn’t let his humble background stand in the way of his ambitions. Married with a toddler and another baby on the way, he quit a good-paying insurance position to try and make it on Wall Street—a “closed, Waspy world back in those bad old days,” as he describes it in I Love Capitalism! He managed to get his first Wall Street job, in institutional sales at broker-dealer R.W. Pressprich, after offering to get paid a secretary’s salary. The rest, as they say, is history. Since co-founding Home Depot—which employs upwards of 400,000 people and hit $100 billion in sales for the first time last year—Langone has become a prom inent philanthropist. Remember hearing recently that New York University (NYU) would now be tuition-free for all incoming med students? That was made possible not because of socialism, but because of donations from capitalists like Langone. He and his wife gave the school $100 million after learning that the U.S. could face a serious doctor shortage in the coming years. As he explained at the conference, only capitalism creates wealth, which is then freely redistributed. Socialism creates little to no wealth and redistributes poverty. People in Venezuela, sadly, are learning this lesson firsthand, as inflation there is forecast to hit an unbelievable 1 million percent by the end of the year. Check out our latest slideshow on the world’s 10 youngest billionaires! Keep your eyes on the price of gold because the Fear Trade is about to heat up. And I’m not just saying that because the U.S. trade war with China is about to intensify even further, with tariffs on $267 billion worth of Chinese goods announced on Friday. It’s been 10 years now since the start of the global financial crisis, and emerging markets are signaling trouble that some investors fear could have a spillover effect into developed markets. Last week, the MSCI EM Index, which consists of 24 countries, entered bear market territory after falling more than 20 percent from its January high. EM currencies have been under considerable pressure so far this year, with some of them falling to record or near-record lows against the U.S. dollar. Other factors include global trade tensions and higher oil prices—both of which contribute to faster inflation. Rising U.S. interest rates are also making it harder for governments to pay off dollar-denominated debt. We’re already seeing some slowdown in the global manufacturing expansion rate. The purchasing manager’s index (PMI) has been dropping steadily since its recent high in December 2017, and in August it fell slightly to 52.5 from a July reading of 52.8, with “confidence regarding the outlook for one year’s time [dipping] to a near two-year low,” according to IHS Markit, which compiles the monthly PMI data. Last week gold was trading in the $1,200 an ounce range. But there’s even greater upside potential, I believe, as investors, especially those in emerging markets, seek a safe haven from their country’s weakening currencies against the dollar. Now could be a good opportunity to add to your exposure at an attractive valuation. Turkey was among the fastest growing economies last year, expanding 7.4 percent, but it could be facing stagflation on higher inflation—consumer prices rose close to 18 percent in August—U.S.-imposed sanctions and a private sector debt crisis. The lira has lost more than 40 percent this year, and as I shared with you last month, President Recep Erdogan has urged his fellow Turks to convert gold and hard currencies into lira in an attempt to shore up the country’s troubled currency. The worst performing currency in emerging markets so far this year is the Argentinian peso, off 50 percent as South America’s second-largest economy edges closer to recession. Investors were rattled last week when President Mauricio Macri’s administration unexpectedly enacted new export taxes and austerity measures, including ministry cuts, in an effort to balance the budget ahead of a $50 billion emergency loan from the International Monetary Fund (IMF). With interest rates at an eye-watering 60 percent, the highest in the world, economists surveyed by the country’s central bank forecast an economic contraction of nearly 2 percent in 2018. And then there’s South Africa. Its economy has slipped into recession for the first time since 2009, having contracted for two straight quarters, according to the national statistical service. Among the weakest sectors in South Africa during the second quarter was agriculture, which plunged almost 30 percent on lower production. The best performing sector was mining, which rose nearly 5 percent on increased production of platinum metals, copper and nickel. Exacerbating all of this is historically high levels of debt. Debt in emerging markets stood at $63 trillion in 2017, up sevenfold from 2002 levels, according to the Institute of International Finance (IIF). And as I said earlier, higher U.S. interest rates make servicing this debt more expensive. Speaking of interest rates, I believe it’s a near-guarantee that they’ll be hiked again this month after Friday’s positive jobs report. The U.S. added 201,000 jobs in August, beating economists’ expectations of 190,000. This is the 95th straight month that U.S. employers hired more people than fired—a record streak. What’s more, wages for American workers in August accelerated 2.9 percent year-on-year—right in line with official annnual inflation and marking the fastest pace of wage growth since the financial crisis. This is good news indeed for retailers such as Home Depot. It’s also constructive for the U.S. economy as a whole. Second-quarter gross domestic product (GDP) growth is expected to be revised up to 4.4 percent from the earlier 4.2 percent, based on higher-than-anticipated consumer spending. And the Federal Reserve Bank of Atlanta now predicts GDP in the third quarter to expand at the same rate, 4.4 percent, spurred by strong consumer confidence, lower corporate taxes and deregulation. Explore exciting investment opportunities in the domestic market! The MSCI Emerging Markets Index captures large and mid-cap representation across 24 Emerging Markets(EM) countries*. With 1,137 constituents, the index covers approximately 85% of the free float-adjusted market capitalization in each country. Holdings may change daily. Holdings are reported as of the most recent quarter-end. The following securities mentioned in the article were held by one or more accounts managed by U.S. Global Investors as of 6/30/2018: The Home Depot Inc.